I know it’s April and this post is about 4 months premature, but I cannot freaking wait for football season. The pageantry of tradition, being an overly obnoxious fan, ESPN College Gameday, that game-changing field goal, and most importantly– the parking lot dining. I’m from the South. I went to the University of Florida. 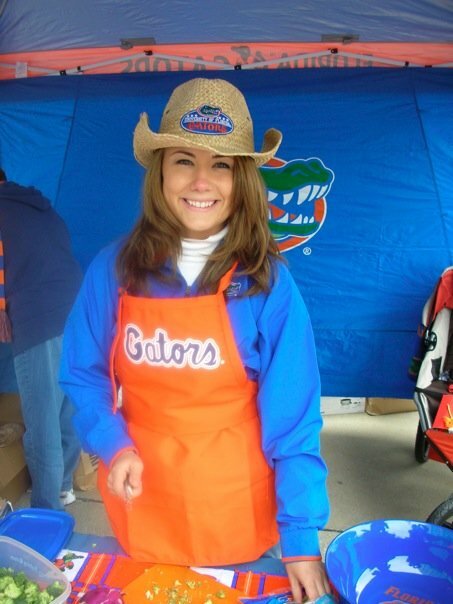 If you want a tutorial in tailgating, you should probably visit Gainesville. Tailgating is a superlative game in itself. There is nothing better than the smell of a charcoal grill, the taste of cold beer and the endless spreads of chips, dips, cheese and crudités. 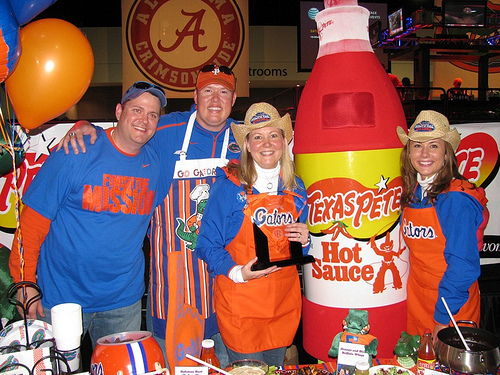 Back in 2009, my sister Alli entered a Texas Pete Hot Sauce contest to try and win tickets to the SEC Championship in Atlanta. 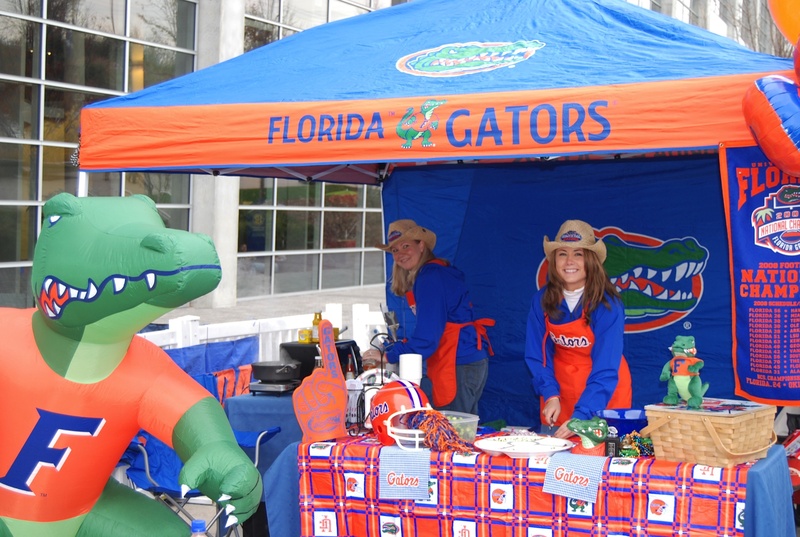 In order to qualify for the contest, you had to submit a photo of your friends or family tailgating . Two “teams” were chosen and the finalists had to travel to Atlanta. There were thousands of entries…and my sister’s was chosen. The next step of the contest was the cook-off. Alli enlisted the help of her husband, my brother, my mom and me to travel to Atlanta and participate in the Iron Chef of tailgating. The catch was that every recipe we cooked had to a) be original and b) incorporate Texas Pete Hot Sauce. We spent weeks drafting our recipes and assigned them with catchy gator-themed names. We were ready. Our hearts sank. This dude from Gulf Shores, Alabama shows up in a monster Ford pickup truck, big-haired wife in tow, hauling a professional barbeque smoker. We had a toaster oven and hot plate. I felt like he should have been disqualified right there. He jumps out of his truck and lets out a big “ROLLLLLL TIDE.” I’m pretty sure I let out a big “oh sh*t.” He wasn’t playing around. 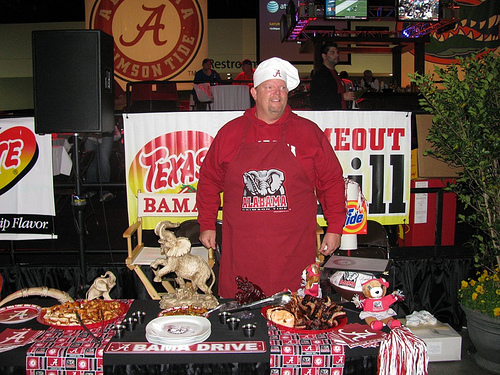 This guy was the reigning Texas Pete Ultimate Tailgate Cook-off champion. He was in it to win it. From there adrenaline kicked in and we cooked our Bryan butts off. We delegated tasks– my brother and brother-in-law manned the grills, I did the chopping/ assembly, and my sister did everything in between. Mom oversaw the whole process and helped where needed. Dad was there for moral support. It was a race to the finish and we weren’t letting the Bama bully get in our way. We eventually made our way from outside the Georgia Dome to inside a convention center. There was a formal presentation and a tasting by a panel of five judges. I was nervous. The Bama dude’s presentation looked pretty darn good and he had brisket, baby back ribs and other southern fare. Ours was creative, though and not as mainstream. After waiting on pins and needles for about 30 minutes the judges made their way to the podium for an announcement. Drum roll…WE WON! We won we won we won! Happy dance! Take that Alabama. Our prizes included tickets to the game, a flat screen TV (which is currently in my living room), a Big Green Egg grill, a Honda generator (I really have no use for that but I guess it’s cool), and some other things that I can’t remember. The best prize of all though was the bragging rights. I am a tailgate cook-off champion. Below are our award-winning recipes. Enjoy! Saute shrimp in butter and season with Texas Pete’s Garlic Sauce and Old Bay seasoning until no longer pink. Squeeze 1/2 lemon over cooked shrimp. Set aside to cool. Beat together cream cheese, wing sauce, and dressing until desired consistency and taste. (We like 1/2 and 1/2 ranch and blue cheese) Stir in strained shrimp (we like to chop them up a bit) and cheese. Bake at 350 for 30 minutes or till top of dip is browned. Put potatoes on to boil. Chop vegetables very fine. After potatoes are cooked, mash them one at a time in bowl. Add salt, pepper, eggs and vegetables. Add the mayonnaise and mustard, and mix thoroughly. Add Texas Pete’s Garlic sauce to taste….should have a kick, but not too spicy. Combine first 5 ingredients together, making sure to break up broccoli into bite-size pieces. Mix with dressing just before serving. Combine Chopped jalapenos with the ground chuck in a bowl. Make small, slider-sized patties with the ground chuck mixture. Marinate the burgers in the Bourbon Meyer marinade for at least 2-4 hours. Combine the avocado pulp, juice of ½ a lemon, cilantro, ranch dressing and Texas Pete’s Garlic Sauce in a food processor and then reserve until ready to top the burgers. (Make sure to cover the Swamp Sauce with plastic wrap so it does not turn brown before using) Grill burgers and toast sweet rolls to use as buns. Garnish the bun with a few pickle slices, and dress the burgers with the Smoldering Swamp Sauce. Combine all rub ingredients and mix thoroughly in a large plastic container with lid. Take chicken wings and roll each wing individually (one-by-one) in the rub. (Optional) You can add Texas Pete’s to the wings before applying the rub if you are having trouble with the rub sticking, but often the moisture in the wings should be enough for it to adhere. Preheat an outdoor grill for medium-high heat. Using a pot that can be placed on the grill, melt the butter and combine with ½ of the bottle of Texas Pete’s Wing Sauce. Place chicken wings on the grill, and brush generously with this sauce. Grill, turning and basting frequently for 20 to 40 minutes, or until meat is no longer pink and the outside is brown, crispy and extra done. Place wings in large plastic container, add the remaining Texas Pete’s Wing Sauce, cover with lid and shake thoroughly, making sure sauce completely covers each wing. Serve these with Bleu Cheese dressing; you can also add on celery and/or carrots. Melt chocolate chips and heavy cream in 2-quart saucepan over medium-low heat until smooth, stirring often to prevent burning. Add in Vanilla Extract and Texas Pete’s Original Hot Sauce. If chocolate mixture becomes too thick, you can thin it out with a bit more heavy cream, stirring until it reaches desired consistency. To serve, drizzle fruit kabobs with chocolate fondue. Great memories and great food!